The Voice of India, vol. 1 no. 1 (September 1944)- vol. 3 no. 6/7 (April/May 1947), Library of Congress. I have copied selections from issues from September 1944-December 1945. After first issue, each publication begins with section, “Looking Around,” which summarizes major developments in India, which is followed by an “Editorial” written by Anup Singh, the main editor. November 1945, vol. 2, no. 2: “Mrs. 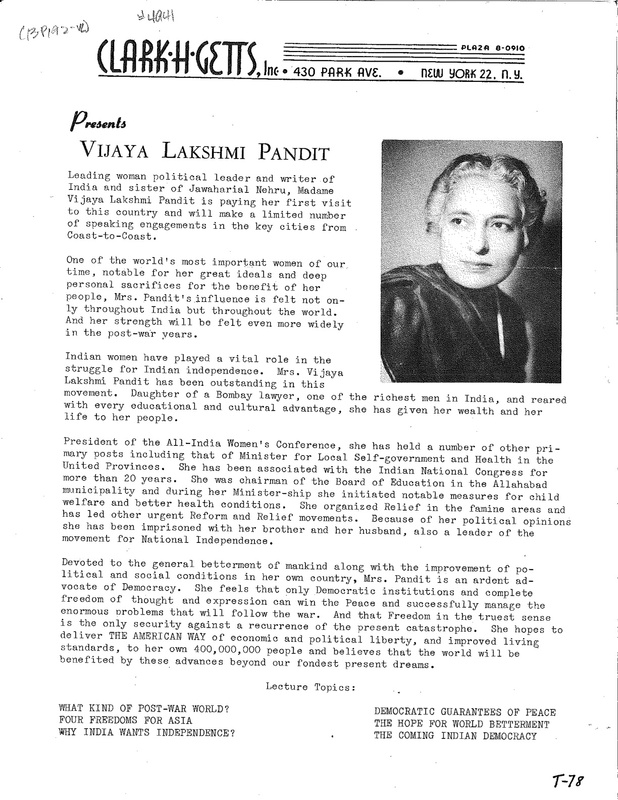 Pandit Calls on President”—“On October 31st, Mrs. Vijaya Lakshmi Pandit, accompanied by Hon. Emanuel Celler, called upon President Truman at the White House. She is probably the first Indian to have met the President of the United States without the usual diplomatic formalities” (197). Muzumdar, Haridas. America’s Contributions to India’s Freedom. Allahabad, India: Vanguard Press, 1962. The recollections of Dr. Haridas T. Muzumdar, a close associate of Gandhi and an Indian-American who worked to gain American support for India’s freedom. “Hossain, Anup and I looked upon ourselves as crusaders for India’s freedom first and as professional lecturers or writers second” (28). 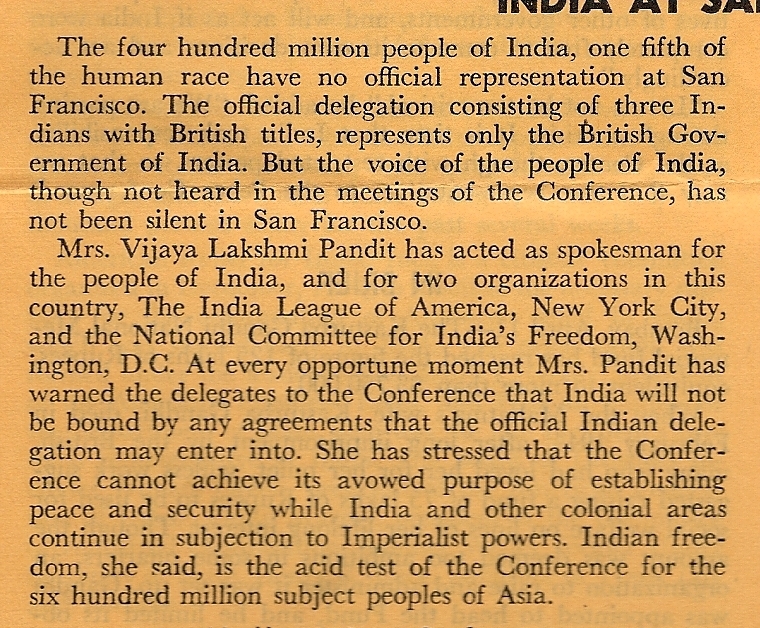 “While Syud Hossain, Anup Singh, Shridharani and I had been doing significant work on behalf of India in our individual capacities, it seemed to me in the mid-thirties that an organized effort to promote India’s cause might be in order” (42)= founding of the India League of America with Mr. N. R. Checker as president and Muzumdar as secretary. “Through his business contacts and with businesslike methods, Mr. J.J. Singh brought new blood into the organization. American citizens were invited to become members and were elected to serve on the Executive Board. This lent prestige to the organization and made it more effective” (43). After Anup Singh left the League to help found the National Committee for India’s Independence in Washington, DC, William D. Allen replaced him as editor of India Today: “I [Muzumdar] know of no American who has made greater sacrifices…for India’s cause that William D. Allen” (44). Members of India Lobby felt a need to have an organization based in Washington, DC and so founded the National Committee at the end of 1943 with Dr. Syud Hossain as president, Muzumdar as V.P., K. Shridharani as the second V.P., and Anup Singh as secretary (44). “As the sister of Nehru and a leader in the National Congress for two decades, she was the only important nationalist figure permitted to visit the United States during the war” (151). “Clark was intelligent, sophisticated, and creative. His many interests included art, literature, current events, and history. Although his company was a small one, her was highly respected in the field” (Imperato, They Married Adventure: The Wandering Lives of Martin & Osa Johnson, 194). Papers, 1932-1980. American Heritage Center, The University of Wyoming. Andrews, Robert Hardy. 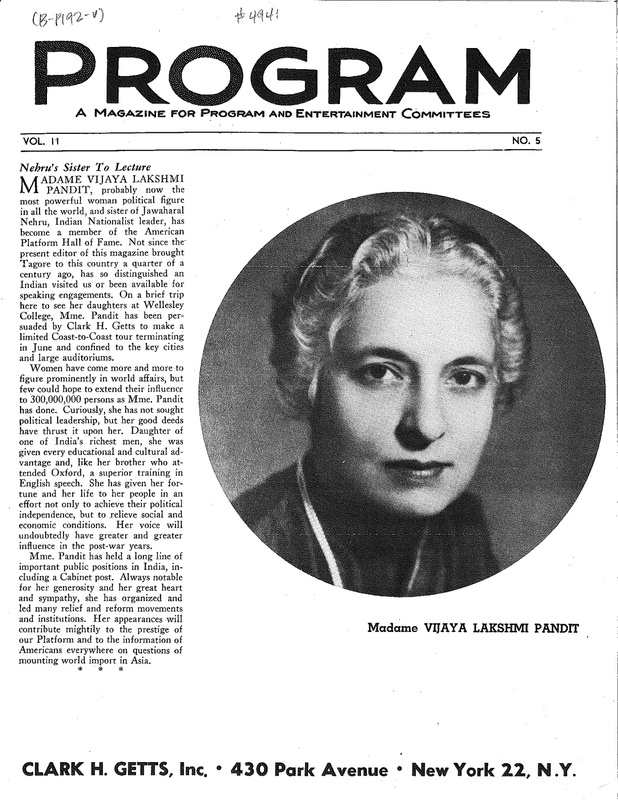 A Lamp for India: The Story of Madame Pandit (1967). Grover, Verinder and Ranjana Arora, ed. Vijaya Lakshmi Pandit. Vol. 4, Great Women of Modern India. New Delhi: Deep & Deep Publications, 1993. Guthrie, Anne. Madame Ambassador; The Life of Vijaya Lakshmi Pandit. New York: Harcourt, Brace & World, 1962. Jensen, Irene Khin Khin. “The Men Behind the Women: A Case Study of the Political Career of Vijaya Lakshmi Pandit,” in Contributions to Asian Studies, Vol. 10, 1997, 76-93. The Scope of Happiness: A Personal Memoir. New York: Crown Publishers, Inc., 1979.